I’ve been busy puttering outside and planting some early lettuce, carrots and radish in the garden. To keep track of what’s planted where, I wanted to make a few garden markers. They’re nothing fancy but they were really inexpensive and ridiculously easy to make, plus they’re cute. Yes, they’re clothes pins that I painted and attached to a stick from the yard. I used the leftover exterior green paint that I used on my garage door last year and simply wrote the name of the seeds on each using a waterproof Sharpie. I was going to find a way to put some pretty lettering on them but there’s not much writing room on a clothes pin, and I wasn’t sure how it would hold up with the weather, so I just kept it simple and went with the Sharpie. Just for fun, I dipped a couple pins into white paint to add a little stripe. 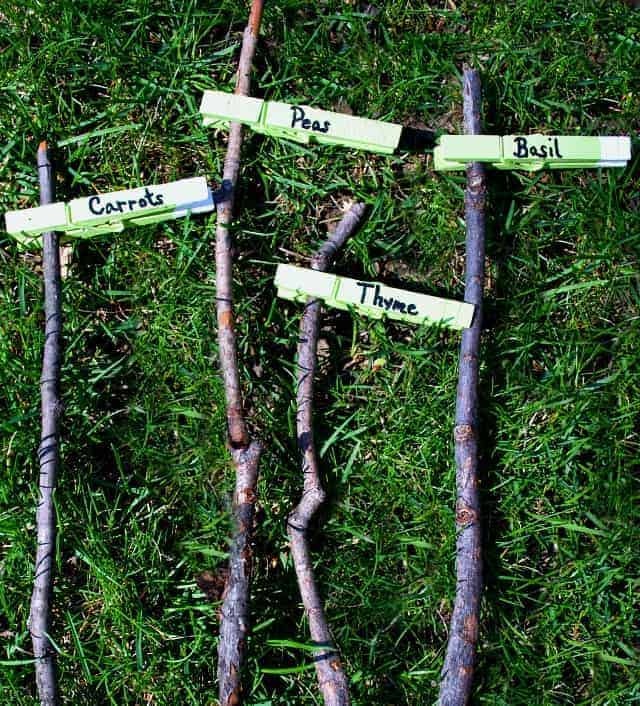 The possibilities are endless and it’s a fun project to do with the kiddos. Like I said, not fancy, but fun and functional and it only cost me $1.59 for the clothes pins. If they only make it one season it’s not a big deal. I can make more next year or to try something else. With the garden taken care of, we can turn our attention to hanging outdoor cafe lights (to light up the garden). My garden markers actually made it through the season quite well. I’ve gotten quite a few comments about using a Sharpie and having it fade but I didn’t run into any issues. As a matter of fact, I’m using my markers again this year. Love them! 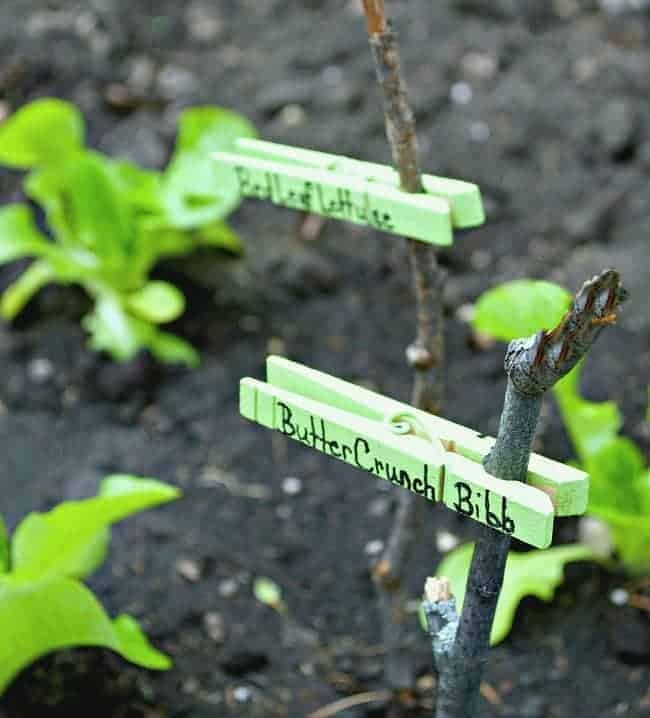 Have you been able to plant anything in your garden yet? 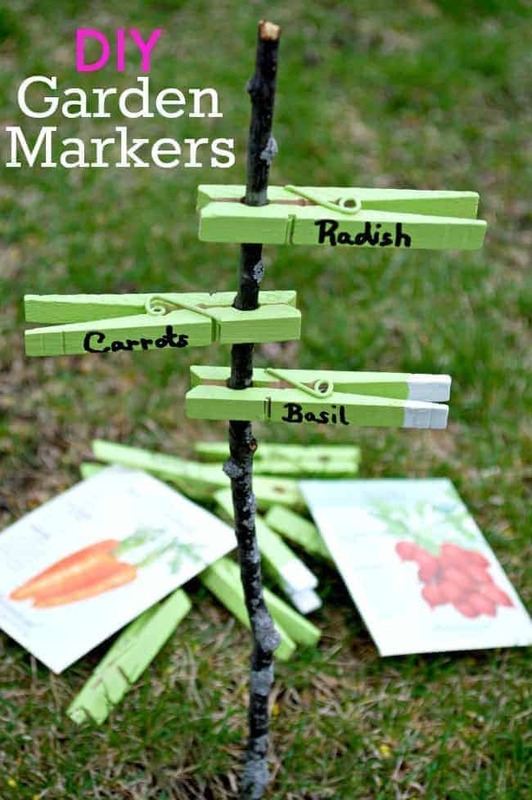 Would you make your own DIY garden markers? So simple and elegant at the same time! Love this idea, Kristi!! We recently moved out of our trailer and into a home here in Texas and I am looking at the yard and trying to figure out where all the garden rooms will be. Next fall, lettuces for sure! Just doing herbs and tomatoes for spring and the roses will go in the ground pretty quickly here. 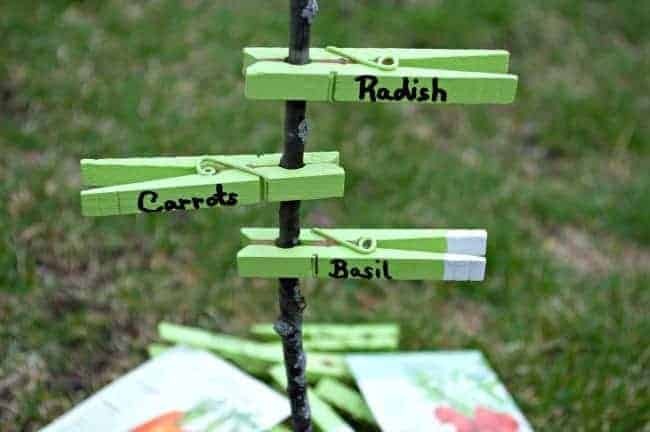 this idea for tags for your garden. How cute is that? I can’t wait to get home to Oregon so that I can do this with my grandson. He’ll love and so will I. I like to have him take all our old leftover seeds from other seasons and plant them. I need to ask you about your door handles. Where do you get them. I saw the square ones for your front dooe and I’ve been looking for something like that. Keep up your good work, I love it! Hi Jean and welcome! I’m thrilled that you found me through Rhoda. I love everything she does! I’m so happy to hear that you liked my garden marker idea. 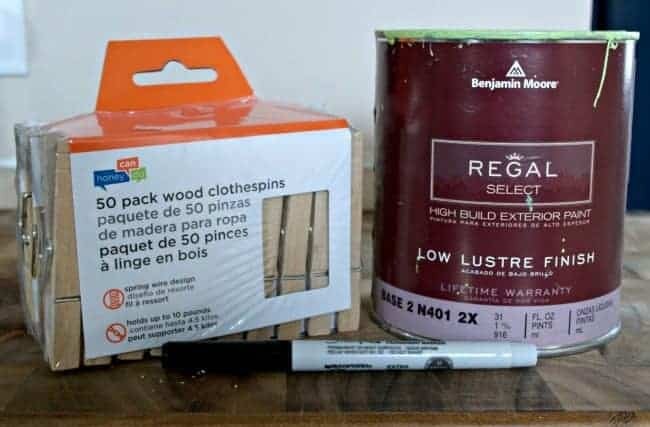 So easy but I think it would be a fun project to do with your grandson. It sounds like he is on his way to being a good gardener and homemade markers will be the perfect touch. Thanks so much for stopping by and say hello! Thanks, Emma. Such a fun project to do! Omgosh, I love these! Such a crazy smart idea and easy to make as well. Thank you so much for sharing your project with us at Merry Monday this week! Thanks again for sharing at the Thursday Favorite Things Blog Hop! Stopping in to let you know your cute little garden markers will be featured on Tuesday Treasures! Stop by and take a peek! That’s great Debi! I will certainly stop in to take a peek. Thanks so much! Ooooo, that sounds like a great Mother’s Day gift. My husband never remembers either. I drew a garden map for him last year. Thanks so much for stopping over from Feathered Nest link party. I love clothes pins! You can do so many fun things with them and this is one more great idea. Thanks for sharing with the Thursday Blog Hop! They are so versatile, aren’t they Pam? Thanks to all of you ladies for hosting such an awesome party. What a great idea! I have a lot of these hanging around and I will them to good use with this idea! Thanks for sharing at the Thursday Favorite Things Blog Hop! Thanks Debi! I appreciate you dropping by today. Thanks so much for stopping in from Favorite Thursday Things Blog Hop. I love this idea. Clothespins are so much fun to paint and make things from. I’ve used them for magnets and to display photos but never thought to use them in the garden. I love the color and whimsy they add. Thanks for sharing this idea! Thanks so much Cheryl. Clothes pins are very versatile and it helps that you get get them so inexpensively. This is an adorable idea! I’ve made all sorts of plant markers over the years and one that I haven’t perfected is one for my tomato cages marking the variety. I intend to use this idea this spring. Thanks Paula. I’ve tried different thing too and I’m hoping these will hold up. Hope you get to make them and they work for you. Great idea and super cute too!…. Thanks Shirley. Hope you have a great week! I am not a gardener. However I have gown petunias and a couple hard to kill indoor plants in the past. I love the results of gardening but I seem to have a black thumb. LOL Great idea with the clothespins. Thanks Debbie. I love to garden but it is harder to grow certain things in Florida. We could never really keep a garden when we lived down there (so maybe it isn’t your black thumb 😉 ). It’s great to be able to grow tomatoes again.